Clicktodiscount.com > BirchPress Review – Best WordPress Appointment Booking Plugin? BirchPress Review – Best WordPress Appointment Booking Plugin? BirchPress is a common wordpress appointment booking plugin. BirchPress Scheduler was designed to be the perfect tool for small businesses of all sorts. So if you are still considering whether to use this plugin or not, my BirchPress review can help you to make the right decision. In this BirchPress.com review I’m going to inform about BirchPress features, pricing and some of my recommendations. BirchPress Scheduler Pro is an appointment booking and management plugin that allows service businesses such as spas, yoga studios, contractors and photographers to take online appointment bookings. By adding this plugin to a website, it will allow your clients or customers to book appointments at pre-defined locations or branches of business. They can select from the different services on offer, and then select one of the members of staff who offers that service. Customers can also view the calendar to check availability, and staff members can login to the website and check their schedules. There are many potential businesses and service providers who can benefit from a plugin like BirchPress Scheduler Pro, including spas, salons, doctors, clinics, lawyers, coaches, tutors, and so on. If you are offering multiple services from many locations, then you can make great use of this scheduling plugin for WordPress. To find out how this plugin works, what features it contains, and how easy it is to use, here is my BirchPress review. BirchPress Scheduler Pro have all the features that you need to manage an online schedule and appointment booking system. Many BirchPress reviews also confirm this. To give you an idea of how to take full advantages of this plugin for your business, this BirchPress plugin review will provide you with some main features. A booking form can be embedded in a page or post via shortcode. Visitors to your website will be able to check availability and book appointments or make reservations online directly. If you are offering multiple services, by a range of staff, from a number of locations, then this sscheduling plugin for wordpress is a good choice for you to do all that. Through the admin interface you can create multiple variations for each entity, in order to match the type of business you are running. Visitors can then select from the various options that you have made available to them when booking an appointment. Whatever calendaring system you are using, there is a good chance it will sync with BirchPress to ensure your schedule is up to date and vice versa, for example Google, iCal, iPhone, Android, and Outlook. You can easily configure notification emails that are sent when an appointment is booked, rescheduled and cancelled.These configurable email notifications and reminders can keep you and your staff informed of the schedule, and also remind customers or clients when their upcoming appointments are approaching by sending customizable, friendly email reminders about upcoming appointments. This is one of my favorite features that I cannot forget to mention in this BirchPress review. There are thousands of functions, action hooks, and filters that developers can use to create their own custom functionality without ever touching the core code.You can quickly build and design your booking form using the built-in form editor. You can also pick and choose different types of fields you want to meet your business needs. Online payments is also a really helpful feature that I need to inform you in this BirchPress plugin review. With BirchPress Scheduler Pro, you can take payments when customers make an appointment or booking. The plugin includes the facility to accept credit card and PayPal account payment. Other payment gateways can be supported through WooCommerce integration which allows customers to schedule an appointment as well as pay for it in advance. As you can see BirchPress Scheduler Pro has some very useful features and gives you lots of control over how you allow customers and clients to book your services online. How to use BirchPress Scheduler Pro? Since this BirchPress Scheduler Pro has a lot of useful features, you should take a look at how to make great use of this plugin. BirchPress is quite easy to use, you just have to spend a little time learning and figuring out how to use this. This BirchPress.com review will tell you about BirchPress ease of use in details. 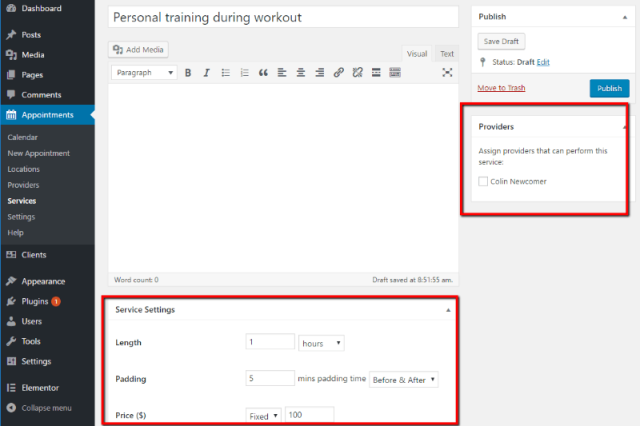 Localize the plugin by setting the time zone, date and time formats, currency etc. Step 2: Add Location, Staff and Service providers. Before you start adding appointments to your new calendar, you should fill some information about your service. Because of the easy to use interface, adding new locations, services, and staff, is all very straightforward and the procedure will be familiar to anyone who has used WordPress before. First you have to head to Appointments → Locations and click Add Location. Next, when adding staff to your site, you are able to set their days off in order to prevent them from being booked when they aren’t working. You can also set a schedule for each member of staff, including their regular working hours, and days that they don’t work. Each member of staff can have a different schedule for each location you’ve created. After that, you’ll want to add your different service providers. 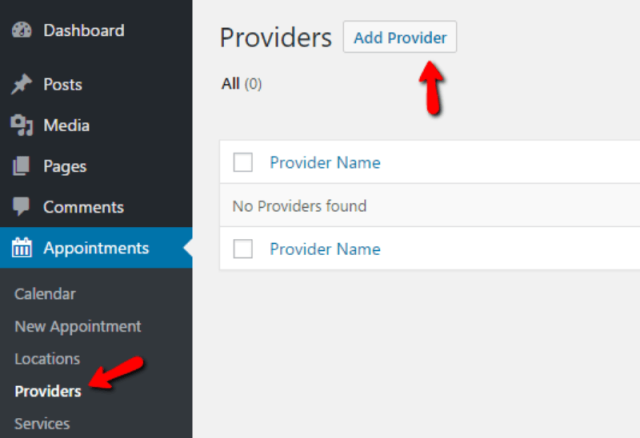 To do that, go to Appointments → Providers and click Add Provider. Now you just need to add the services that you offer so that your customers can choose from that. To add a service, go to Appointments → Services and click Add Service. After everything is configured, it’s time to add your booking to your website. For my example, I’ll create a new page called Book an Appointment. You can easily view your appointments by going to Appointments → Calendar. So you’ve just done creating your very own appointment booking system using WordPress. I hope my instructions in this BirchPress review is clear enough for you to understand. If you want to get additional discount on BirchPress Scheduler Pro, don’t forget to try these BirchPress coupon codes. In conclusion of this BirchPress review I want to emphasize that this BirchPress Scheduler Pro is a really useful scheduler which has a lot of features to help you to book appointments online. Even for a business that doesn’t allow customers to book their own appointments, this would still be a really useful internal online calendaring and scheduling system for use on a WordPress site. If you are looking for a WordPress appointment booking plugin that can handle multiple locations, services, and members of staff, while also offering a great set of features, combined with ease of use then BirchPress Scheduler Pro is highly recommended.